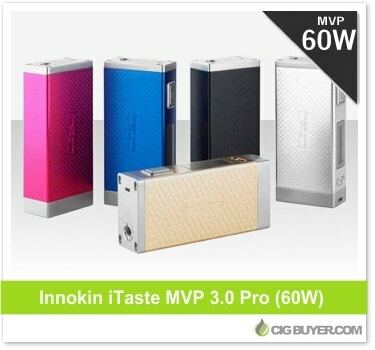 The Innokin iTaste MVP 3.0 Pro mod is the new and improved version of the recently released iTaste MVP 3.0. It’s almost identical and has most of the same great features, but offers twice as much power (up to 60W) and includes a HUGE 4500mAh battery. It’s packed with functionality, has an easy to use operating system, features a spring-loaded brass contact and is capable of firing down to 0.2 ohms. Plus, it looks great and is available in silver, fuchsia, black, blue, and even gold.